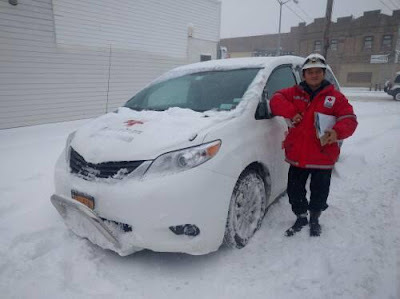 Red Cross Volunteer Tashi P. responding to disasters during the Blizzard of 2016. Over the last 7 days, the Greater New York Red Cross provided emergency assistance to 101 adults and 28 children following 39 local disasters. Here are some highlights from last week and a preview of upcoming activities (see below). On Sunday, while New Yorkers were digging themselves out from the snow, the Red Cross responded to a 4-alarm fire not too far from our Manhattan office in Hell’s Kitchen and provided support and emergency assistance to residents who were forced to evacuate from their homes. The heavy snowfall didn’t stop our volunteers, like Tashi P., from helping others after local disasters, like the multiple-alarm fire on 175th street. Speaking of snow, the Blizzard of 2016 (AKA Jonas) brought record snowfall, but the Red Cross was on standby and prepared as was reported by Currents NY. Communications Officer Abigail Adams spoke with the Greenwich Sentinel and provided tips on preparing for the winter storm. Just prior to the mega storm, we posted 9 Tips to Keep Your Pets Warm and Safe This Winter on our blog. Jan 27, 29: Red Cross blood drive; 1 to 7pm; 520 West 49th Street, Manhattan. Schedule an appointment to donate today. Jan 30: ABC7’s Bill Ritter will be hosting the station’s annual Operation 7 Save-a-Life campaign program at 7pm. Tune in to see the Red Cross Home Fire Preparedness Campaign featured. Feb 6: The #GetAlarmedNYC campaign to help save lives by installing free smoke alarms in the community will make its way to West Brighton, Port Richmond and Randall Manor (Staten Island) next month. Volunteer or sign up for a free smoke alarm installation at www.redcross.org/GetAlarmedNYC.